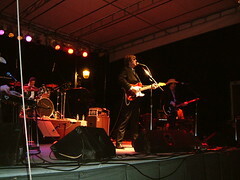 The Derailers' return to the Black Swamp Arts Festival (they first played the festival in 2003) introduced a new line-up to the Black Swamp audience. The new line-up brings brilliant guitarist and band co-founder Brian Hofeldt to the frontman role, and includes the addition of Sweet Basil McJagger on keyboards. Noticeably absent is co-founder and former frontman Tony Villanueva, who left the band amiably early in 2004 to spend more time with his family and to concentrate on his songwriting career. The Derailers' characteristically infectious sound still bridges the gap between Bakersfield and Liverpool, blending the honky-tonk twang of Buck Owens with the pop sensibilities and backbeat of the Beatles. The result is a crisp, expertly rendered hybrid that retains its honky-tonk authenticism. As a frontman, Hofeldt is a capable vocalist, in the style of Buck Owens, but his vocal style does not lend itself to the material Villanueva used to perform with the band. Those songs were missing from The Derailers set at Black Swamp. Hofeldt and company filled the gap admirably with a sorching, crisply paced set of uptempo selections from past albums, and from an upcoming release. The result is a new flavor, a harder-edged sound that is less vocal driven, relying more on the tight interplay of Hofeldt's tasty and restrained guitar licks, Chris Schlotzhauer's sweetly lyrical pedal steel, and McJagger's barrelhouse piano. The rhythm section of Scott Mathews (drums) and Ed Adkins (bass) remains as airtight as ever. Where the previous incarnation of The Derailers was a '59 Coupe Deville, this new line-up is a '67 Camaro SS 396. The ride is different, but as cool as ever.